Dealing with rare health issues is never much fun. And when the possibilities are shadowy and evasive, it is not only difficult to diagnose, the uncertainty itself becomes a source of anxiety. With this as a backdrop, we found ourselves spending a Sunday morning in Bethesda, Maryland as guests of the National Institutes of Health. Yep, not a misprint … a Sunday morning in the monolith to American medical innovation and research just north of D.C., that black hole of Government bureaucracy. Naturally, on a Sunday morning this huge facility was as quiet as a catacomb with barely a smattering of staff on hand for The Institute’s routine of Sunday sample processing. Why Sundays are preferred was not clear to us before our trip; but – to be honest – the off hours arrangement reduced our anxiety level by several orders of magnitude. We were there for only a few hours, performing a rather simple step that could lead to either a much more complex round of testing and probing, or – hopefully – the answer we really want to hear, “No worries. It’s not THAT. The indicators were false.” Not that The Answer would belay all our concerns; but at least we could move on to other less threatening possibilities. We ended up at the NIH because local specialists could not nail down the existence of a condition indicated by routine tests, yet elusive to medical imagery technology. A nationally renown expert was the next logical step; and referral to the NIH was suggested. As is the norm for bureaucratic networks, it took us six months to get to the point where patient-specific variables were addressed to the satisfaction of both patient and specialist. Once the arrangements for our visit were finalized, our family physicians were so impressed with our pending NIH visit, you could tell they almost asked if they could go along with us! And so we found ourselves making a Saturday trip to my sister’s house in Bowie, Maryland for our 8:00 AM NIH appointment for the simple task of drawing blood samples. One would think such a routine medical procedure could have been done locally, as so many of us do for a variety of health-related issues. 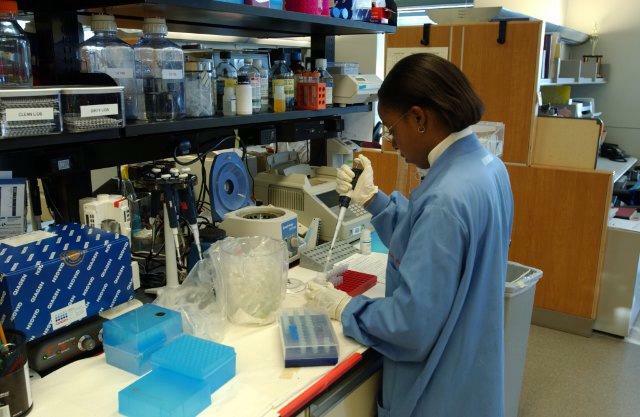 Not so for the purposes of the NIH … Controls in process and technique are understandably crucial when participating in a diagnostic study. Our experience at the National Institutes of Health, aside from the necessity of travel, was nowhere near as inconvenient or irritating as we had feared. Part of that was undoubtedly the result of visiting this sprawling facility on a quiet, unobtrusive Sunday morning. But by far, the experience was made relatively painless by the helpful administrative and professional employees we encountered there. 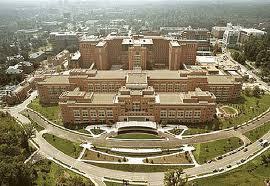 To say I was pleasantly surprised with our NIH visit would be an understatement! From the guards responsible for the physical security of the NIH facility; through the painstakingly thorough, well-organized registration process; to the nurses who administered the sample collection, we were impressed with the professionalism and friendliness exhibited throughout our visit. (I even had the opportunity to argue the merits – and shortcomings – of NFL QBs RG3, Michael Vick, and Tony Romo with both a Redskins fan and a Cowboys fan just hours before Vick played the Steelers as though the football itself had contracted an infectious disease!) In roughly three hours time we completed the entire exercise and were on our way out. Our biggest problem? Trying to solve the cheese-at-the-end-of-the-maze challenge of finding an open exit from which to escape the monstrous facility. We were convinced it was part of the evaluation process … some form of intelligence assessment. How long would it take these rubes to find their way out? All that was missing from making the test a viable reality show concept was a back seat full of over-dressed, pruning dance moms or elimination challenges at each inaccessible gate! As a moderate political conservative, who eschews the huge footprint of Big Government, most would expect me to look at an organization like the National Institute of Health as a monumental example of bureaucratic excess. I like to think I’m more pragmatic than that. There are several valid arguments for the benefit of federally funded footprints on basic social functions. Some are glaringly obvious … National Security, Emergency Management, Social Safety Nets, Interstate Commerce, Transportation Safety. Others may not be so obvious, yet are just as important to a well-functioning society that is responsible for maintaining and improving the health and welfare of its citizens. The NIH performs research in a number of fields including obvious ones, such as cancer, Alzheimer’s, aging, and infectious disease, and less familiar studies in human genome, bioengineering, and environmental health sciences. Health and medical research are vital contributions to the advancement of societies. It’s difficult to imagine a scenario where social development can be successful if the overall health of its members are left to the vagaries of commercial research and the lure of The Almighty Dollar. Having a nationally recognized hub for research that ensures growth in knowledge, better health, and healthier behaviors is a benefit to everyone. Now, from my scant exposure to the NIH, I can’t claim to be in a position to know everything the NIH does or to judge the merits of all they do. But from the point-of-view of a citizen seeking the relief of knowing what’s on the horizon, it’s comforting to know that medical frontiers are being explored. This entry was posted in Deep background, Reviews, social issues and tagged government, national institutes of health. Bookmark the permalink. ← Romney clearly the winner in Round 1!